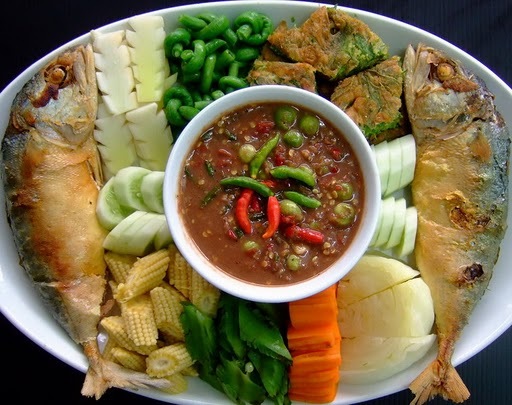 Thai food is an amazing variety of tastes, textures, traditions and colours. To be Thai is to eat Thai food. I have not come across a people so in love with their own cuisine. I believe it is one of the reasons why Thai people find it difficult to travel when the new country has little of their home food available. 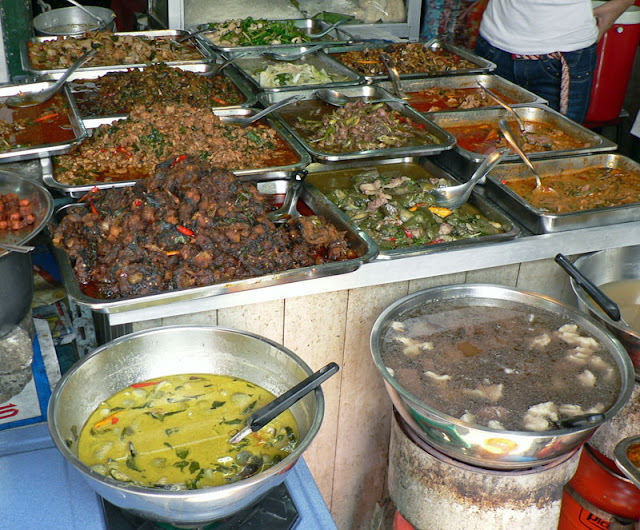 The 4 main regions of Thailand, Bangkok, the North the North east and and the South all have their Thai food specialities. I lived in the south for 17 years and so if this isn't a complete list it is because my knowledge is biased to that region. Thai curries vary by colour! Red curry is a strong hot curry from a red chili paste and has lighter variants like the Nam Prik pau that is sweeter and works well with shell fish. The famous and popular Green curry is quite sweet and uses green tomatoes and green pea like bean that pops in your mouth when you bite through it. The Yellow curry is the mildest and has a madras flavour to it. This versatile curry is good with all the meats, fish and shellfish. Jungle curry is a particularly spicy and dark food that has exceptionally strong tastes and uncommon local vegetables in it. Thai SoupThe Tom Yum soup is the iconic dish of Thailand that blends a chicken broth, mushroom, chili and lemon flavour and is served with rice. 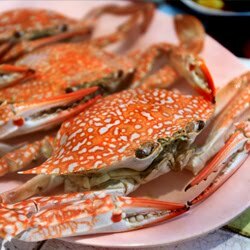 It creates a refreshing and light dish that is highly popular with tourists. Tom Ka Khai soup is a light coconut and chicken broth soup popular with children. This chicken dish is another favourite amongst travellers as it is an interesting taste without the strong chili tastes. Geng Liang is a light soup with a vegetable broth base and an egg which is supposed to be good for women during pregnancy. 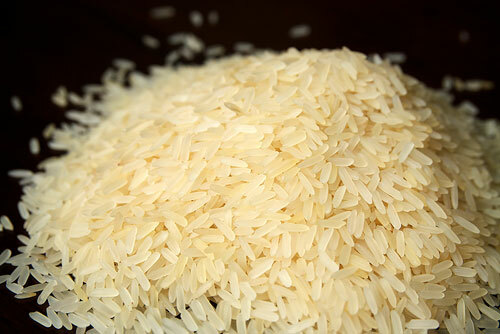 Thai rice is world famous as a long thin rice with a fine taste and beautiful aroma. This elegant rice compliments most Thai dishes and is an integral part of Thai food. Khao Tom is a celebration of rice soup and is the "Home Food" of choice after a night on the town. It is the soup for kids and comes with chicken, fish , shellfish and more. 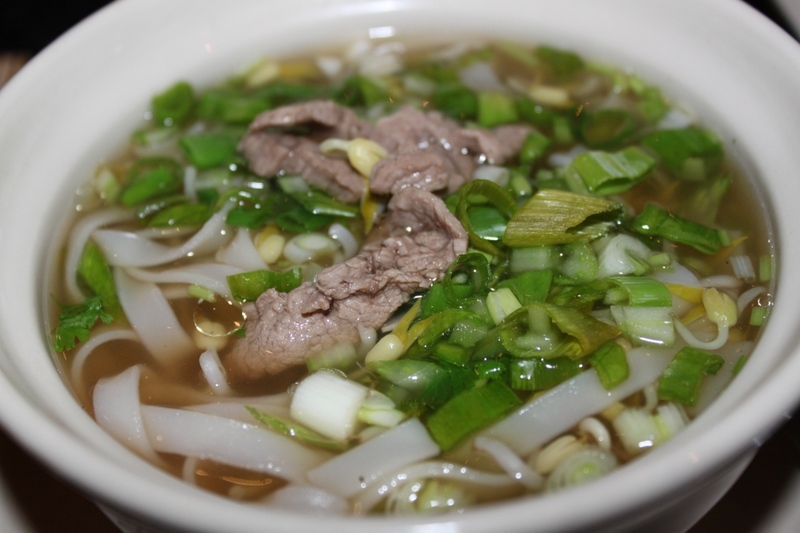 Jok soup is Khao Tom for babies above a certain age. Jok is where the rice is mashed up so the kids can digest it easily. Chicken Rice (Khao Man Gai). 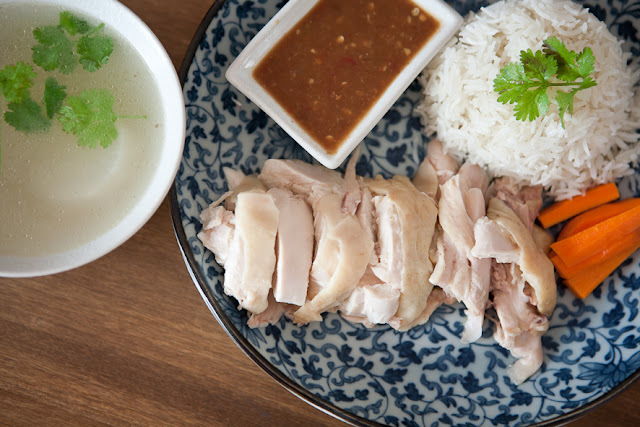 Chicken rice is an Asia wide phenomenon. Rice boiled with the smallest amount of oil garlic and ginger sits along side boiled chicken or pork, the meat so soft it falls off the bone. Other condiments are coriander, chicken broth, sweet chili sauce, soi sauce, and raw chili and raw garlic. This is predominantly breakfast but is served through out the day. Spicy Thai food is complimented by very sugary sweets. There are many ways to reduce that burning sensation in your mouth and one of them is the Thai desert. 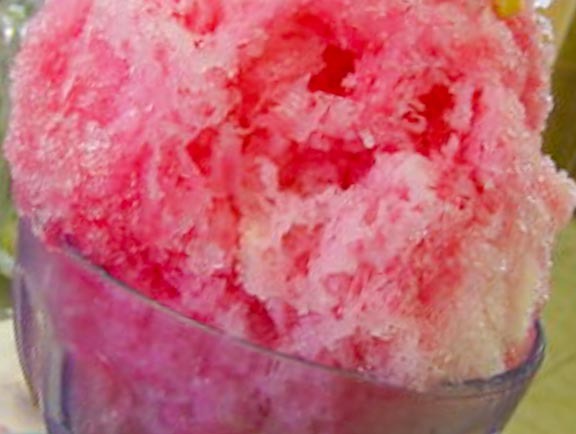 Dishes of sugary coconut and fruit flavoured sweets are served up with crushed ice and drenched in a fruit syrup. This is also a real favourite with the kids who love them on those really hot afternoons after school. 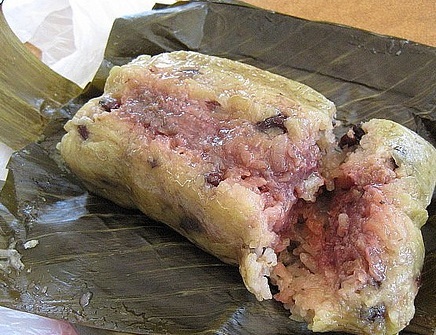 However my favourite is the banana leaf covered sticky rice roll that has mashed banana as it's centre. This is a morning desert taken with Thai coffee or tea. The sweet of the banana the carbs of the sticky rice set me up for the day.... yuuum. 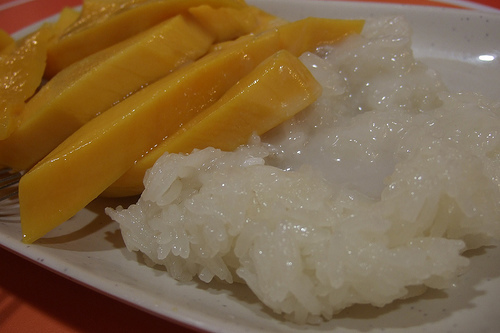 Mango Stick Rice with coconut sauce is a big hit during the mango season November through till April. The yellow ripe fruit hide under the green or yellow skin just want to explode on your taste buds. The coconut milk and the stick rice make a perfect dish. 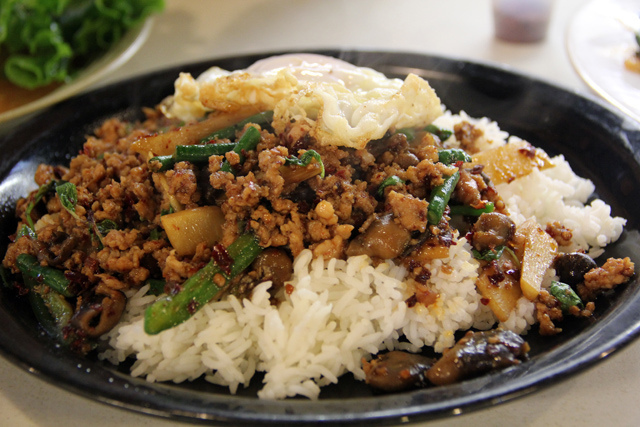 Bai Krapaow has a strong holy basil content to a fast fry spicy meal popular as a Thai snack. The holy basil has a flavour that when mixed with the chili and garlic produces a strong and striking taste. Served with a fried egg on top, it's the right way to start the day of have a light lunch. The Thai Chili The unassuming Thai chili has tremendous power and rates as one of the world's hottest. The hottest variant are the smallest ones that are green or red. Koitio Nam is basically noodle soup and in the south comes with 3 types of noodle choices, fat noodles, Sen Yai wire thin noodles Sen lek or yellow noodles Sen Luang . The fish or chicken broth, the noodles and the main ingredients are mixed together with soi sauce, chili and lime.... spectacular. 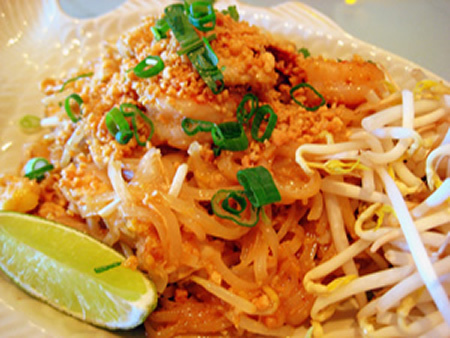 Pad Thai is one of the most popular dishes for traveller as it is basically fried noodles and this is popular all over the world. Where Pad Thai is special for me is the ground peanuts and the lime and shallot flavouring. Often this is sold on the streets as a snack. 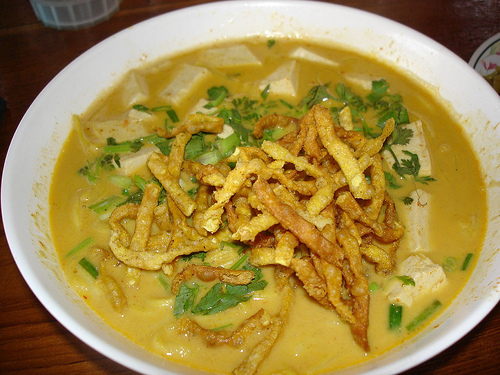 Khao Soi is one of my favourite Thai dishes. It has the lovely texture of smooth and silky noodles with the bite of a relatively madras style yellow curry. The noodle dish is very popular in the North of Thailand. 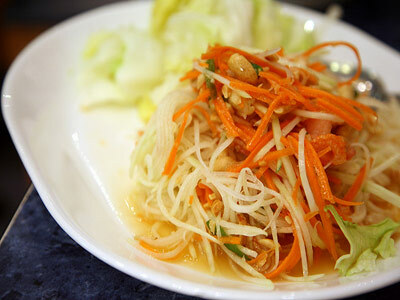 Thai salads are hot and spicy and add crunchy fruit or vegetable with nut, chili, fish sauce and may be crab legs. Som tum is from unripe papaya and is a great delicacy in the south eater with BBQ chicken. Nam Prik is one of the key sauces which you can find on almost every table in a restaurant and is chopped chili in soi sauce. 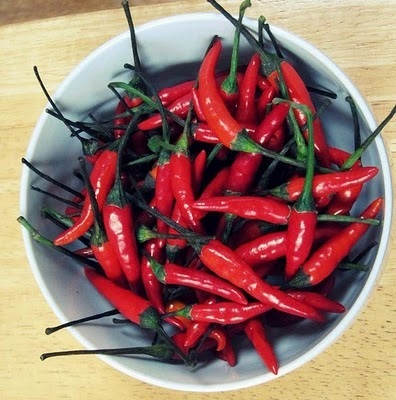 Depending on how long the chillies have been soaking the soi will effect the strenght of the chill. Thai Food in Thailand Nam Prik is the chilli dish in the centre. This dish is popular in the south. Fish Where to start. Any diver on Phi Phi Island, Koh Racha Koh Tao will tell you that the season of Thailand are abundant. On top of a huge range of fish there is a wide selection of shell fish prawn and lobster. In land catfish is a particular delicacy for it's fine grained and tasty flesh. 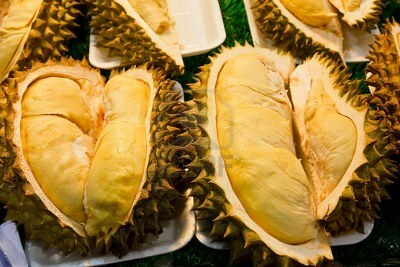 Durian, pineapple, coconut, mango, lychee, jakfruit , papaya are just a few of the distinctive and exotic fruits of Thailand. 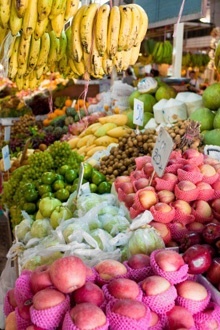 A wonder down the market brings out some beautiful sweet aromas and continual surprises. As I get to this stage I realise that I have barely scratched the surface and so I will end this blog here and return to it when the energy comes through again.